For some reason I am firmly convinced that Nargothrond must have been powered by a goodly number of waterwheels. Here is a random Noldo wandering past one of them. I did this with my new Inktense pencils, which I recommend if you like watercolour pencils, they are like those but much more vivid. The falling water was overpainted in acrylics, and I think looks better in the physical version than in my photo here, but that's life. The New Year began yesterday with a truly horrible cold wet and rainy day. I determinedly went out for a dog walk in Calstock with my mother anyway, and duly fell over in the mud and got very damp and filthy (better her than me though, I am young enough to bounce!). I wish we'd left it till today now, the skies today are a clear blue and everything is green and gold again. That's beautiful! I love the colors, and the perspective is appealing. I'm curious to know what size it is. 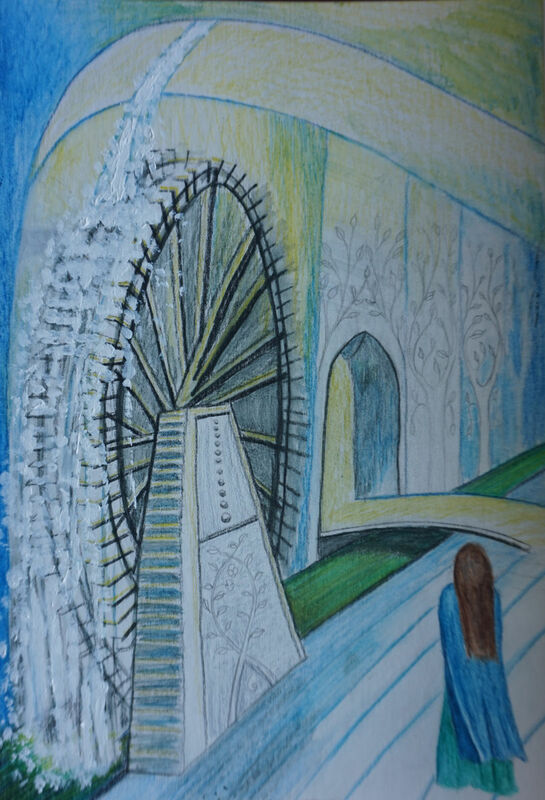 The painting or the waterwheel? The painting is about A4-ish (it's on one of those sheets of card that I nicked out of a skip again! I do love that card). The waterwheel, I don't know. The Noldor seem to be quite tall, so I'm guessing the person in the picture is over 6 foot, so.. quite big? I was wondering about the painting, but it's good to know about the Noldor and the waterwheel, too. Ooh, nice! Yes, waterwheels make a lot of sense. Thank you! They do have all the force of the river to work with, it seems like it would be a waste not to use it! I think there is a canonical water-wheel somewhere in Moria? So, just possibly, one of Felagund's dwarvish influences? I wonder if the Mill in Hobbiton was a water-mill or a wind-mill? The mill in Hobbiton was a water mill--the water wheel is clearly shown in one of Tolkien's own drawings of Hobbiton (I just checked). That's could be a dwarvish influence too!